The aqueduct started from the Ayiades spring, the “great spring” according to Herodotus, where water was collected in a rectangular reservoir covered by stone slabs. In modern times, the chapel of Ai-Yiannis was built on top of the reservoir. The water was transferred from the reservoir, which supplied 400 m3 per day, through an underground clay pipe (length: 890 m) to the northern entrance of the tunnel. It was carried from the tunnel’s southern exit to reservoirs and fountains in the ancient city via a pointed underground built channel with manholes at intervals. The spring water that used to flow in the aqueduct for more than 10 centuries was collected in a remarkable manmade tank that is preserved to a percentage more than 90%. Its stone roof is supported by 17 pillars (~60cm x 60cm), 131cm centre to centre distance, made of hewn stones while on its roof rests a small chapel of unknown date of construction. Its clear height is less than 2m and its maximum clear width is almost 8,5m. Its north-eastern wall has been sculptured in the bedrock. The central section of the aqueduct, the “Eupalinos tunnel” which has a length of 1.036 m and internal dimensions 1.80 x 1.80 m, consisted of a ditch and a corridor (ca. 0.60 m. wide). The depth of the ditch ranged from 4 m in its northern section to 8.90 m in its southern one, to ensure gravitational water flow. The water was channeled through clay pipes, parts of which may still be seen today in the depths of the ditch. The maximum overburden of the tunnel is ~ 170 m below the summit of the mountain and its elevation is 55 m above sea level. The astonishing thing about the opening of the tunnel is that the hard limestone was hewn out simultaneously from both sides (north and south), and two crews of stonemasons, working with hammers and chisels, met with almost no deviation from a straight line. It is estimated that 8-10 years were required to complete the project. The lack of lighting within the tunnel was overcome with oil lamps, which of course made ventilation difficult. When one considers that during that era there were no mechanical means available, the uniqueness grand scale of this project can be understood. After the tunnel’s construction was finished, walls had to be built in certain sections to avoid a possible collapse. The first 740 meters of the aquedact consists of a canal which were excavated as an open trench. Its sidewalls are supported by stone walls and covered with massive hewn stones or brick arches arches. The width of the trench ranges from ~61cm to 25cm in areas where the trench walls have been deformed. 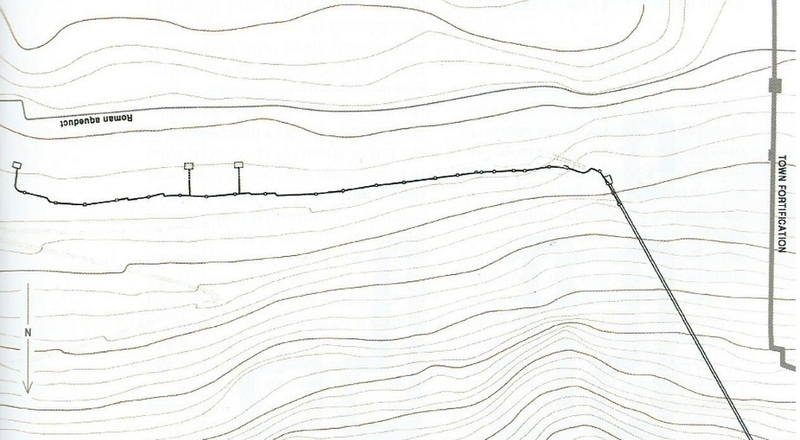 The clear height of the trench varies from 1.5m to almost 4.3m at some locations towards the north tunnel portal. The next 150 meters of the canal is a system of successive lined vertical shafts. Their bottom ends are interconnected with underground galleries. This is the so called qanat method implemented mainly in Persia. The galleries at their bottom host the water conveying ceramic pipeline. A typical clear dimension of a vertical shaft is 80cm x 210cm. 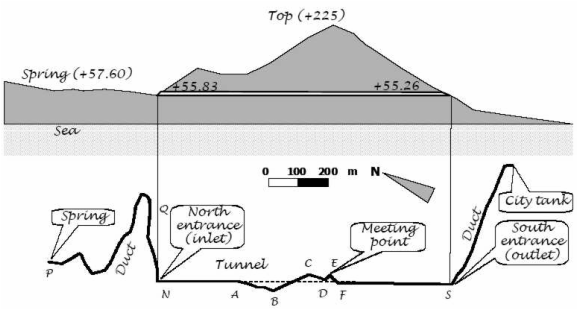 The maximum depth measured in a shaft is 19m under the apex of a hillside located after the north portal of the main tunnel. Nowadays both the trench and the qanat portions of the aqueduct are filled with soil deposits that have been gradually accumulated through time. Massive hewn stones that cover the canal along the first aqueduct part. 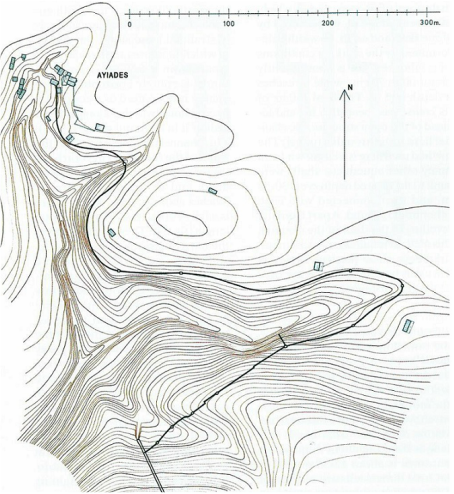 Plan view of the channel from Agiades spring to tunnel entrance. The final ~500 meters of the canal were channelling the water from the tunnel exit down to the central fountain in the city of Samos This part of the aqueduct has been also constructed with the qanat method, which as previously mentioned is a system of vertical orthogonal parallelepiped shafts - 11m to 25m apart - interconnected underground. Plan view of the channel inside Samos city. The project’s engineer, Eupalinos, son of Naustrophos from Megara city, succeeded through calculations and simple measurement instruments (vertical sightings using a level above the crest of the mountain and horizontal measurements through sightings along the periphery) in planning and realizing a remarkable 6th century B.C. work, which even today remains an exceptional technical achievement. Whole words, letters, or simple marks in red on the tunnel’s eastern wall are measuring marks employed for the excavation of the tunnel. Due to large amounts of calcium in the water, the clay pipes soon became clogged by calciferous residues, and holes were opened on their tops to clean them. The aqueduct was in use for at least 1000 years, and was only abandoned when the clay pipes became completely clogged and water no longer flowed through them. According to H. Kienast, a schoral of the monument, all indications suggest that the construction of the aqueduct of Eupalinos must have begun in 550 B.C. Thus it would have been completed before the era of the tyrant of Polykrates’ rules. The tunnel was used as a refuge by the Samians, when Persian and Arab raids in A.D. 627 and 666 respectively forced the city’s residents to remove themselves from the coastal areas for as long as the attacks continued. The clay coarse ware amphorae and lamps as well as coins found duing the excavation of the monument’s interior are from this period.